Prepare the pork steak with a meat mallet. Crumb the pork with the corn flour, eggs and then polenta. Peel the apples and cut into quarters, slice off the core. Place the butter, sugar and lemon juice into a large fry pan and cook until lightly browned. Add the apples and maple syrup, cover and cook until the apples are soft and caramelised. Chop the bacon and fry in a little oil. Add the water and whisk in the KNORR Gluten Free Rich Brown Gravy, whisk until boiling. 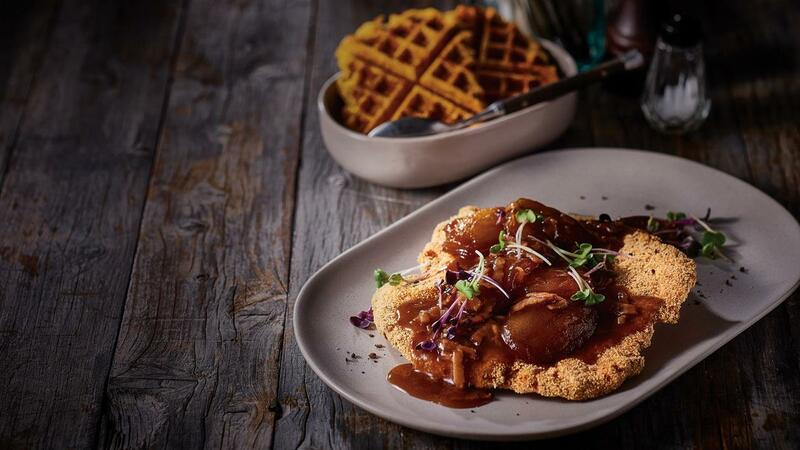 Serve the schnitzel with the apples and bacon gravy.